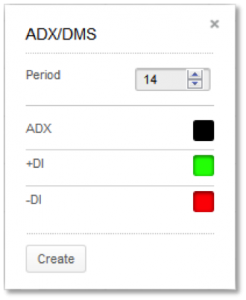 ADX/DMS stands for Average Directional Index and Directional Movement System. It can be used to identify the direction and strength of a trend. Directional Movement (DM) is defined as the largest part of the current period’s price range that lies outside the previous period’s price range. Each period will either be positive (larger range above previous range), negative (larger range below previous range) or zero if moves above and below the previous period’s range are the same or price stay within the previous day’s range. The value of the Plus Directional Indicator (+DI) is the DM, if above the previous range) divided by the average true range. The value of the Minus Directional Indicator (-DI) is the DM (if below the previous range) divided by the average true range. Each period with have only one result, either plus, minus or zero. Calculate the Average Directional Index by taking a simple moving average of the past +DI and -DI values. ChartIQ defaults to 14 periods. You can also select colors for the ADX, +DI and –DI lines by selecting the appropriate box to bring up a color palette. Green and red are often used for +DI and –DI, respectively. The period value in the DM calculation corresponds to trader preference in RSI, Stochastics and other Welles Wilder studies. Daily charts use values of 9 to 14 with 10 being Wilder’s original. Most technical tools fall into one of two categories, oscillators and trend followers. RSI and Stochastics are examples of the former and moving averages and bands are examples of the latter. However, not all studies are effective in the different types of markets. Trend following studies often cause false signals, and hence losses, in flat or erratic markets. This study helps determine whether the market is in a trending mode and if so, how strong that trend is, so the proper technical tools can be applied. The study seeks to find if the item spent more time above or below its previous period’s range. In this case, more time really means a bigger foray in one direction or the other. If moves higher start to accumulate even if closes are not really changing we get an idea that bulls are trying to move the item higher. High and rising ADX indicates a strong trend but not direction. +DM and –DM, not to mention visual inspection, tells the trader market direction. Low and falling ADX suggests whatever trend was in place has or will soon fail. As we can see in the chart, ANZ was in a choppy rally in 2014 and a medium rally. Even though prices were rising in 2014, ADX was falling to indicate the larger swings higher and lower within the trend were possible. Short-term traders could have taken advantage by trading around the trend but staying aware of the upward bias. Overbought and oversold oscillators would work well. Later in the year, ADX started to rise as the movement each day took place farther outside the previous day’s range. –DM was above +DM and the stock had a sizeable correction. But with rising ADX, the cross of +DM back above –DM signaled a likely change in stock direction. ADX moved into very high ground and stayed there. Fighting the trend was a losing proposition for many months and trend following indicators would have worked quite well. Should –DM move above +DM then this spectacular run could be in trouble and traders could look for overbought indicators reversing the trend. 1) Directional Movement (DM) is defined as the largest part of the current period’s price range that lies outside the previous period’s price range.